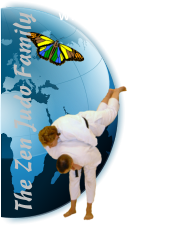 The Zen Judo Syllabus - Orange to Green. All techniques from previous sections. Kata Nage: This is the first technique where it is easily possible to adjust the lift of your partner by modifying the position of your hips during the technique. This gives a student a way to become comfortable being lifted completely off of the floor during a throw. By placing your arm underneath your partners left armpit, it will give you more control over your balance compared to going around your partners neck. Ashi Guruma: This throw is a test of your own vertical balance. It requires you to be able to rotate your partner over an outstretched leg, whilst maintaining your own balance. In order for this technique to work properly, you have to get close to your partner and bring them slightly onto your own hip. The block also needs to remain stationary, if it moves back or forth, then the top of your body will also move and you will loose your balance. (Morote) Seoi Nage: This technique can prove very popular with contest players, but like eri nage, some can find it awkward to perform at first. The key to this throw is to bend your knees when entering so that your belt is below your partners. This will mean that your centre of gravity will be lower than your partners, and therefore the throw will be easier to complete. Sasae Tsuri Komi Ashi: This throw is often described as “The longest name for the shortest throw”. This should be a very explosive technique that you need to commit to fully. If you do not, then it will never work. As you step in for the technique, it is important to bring your own elbows close together and drive upwards. This will bring your partner up onto their toes. They will then be a lot easier to throw compared to being flat footed on the ground. O Guruma: The name of this throw literally means “Major Wheel”, and that is what this throw needs to be. It is very similar to ashi guruma, however the blocking leg needs to come up above your partners knee. This is done so that as your partner comes around, they will come over your thigh muscle and hip. You have to make sure that when you enter for this technique, that you bring your partners weight onto your hips, otherwise you will never be able to get the lift required. Ko Soto Gake: This is also another test of balance. It is important to note that when you first step into the technique, you should drive your partner onto their toes so their balance is shifted. When the hooking leg is applied, your own toes should be on the ground and your knee pointing out to one side. A gentle lean in of body weight should complete the technique. Ko Tsuri Goshi: This throw translates into “minor lifting hip” which tells us that we will be lifting our partner off of the floor by using our hip. For this technique, you enter very low to the ground so it is important to have a very stable stance before trying to lift your partner. When you turn in and place your leg through between your partners, it is important to remember that the aim is to block the leg behind your supporting leg. This will help you to rotate your partner onto their back during the throw. Koshi Guruma: Similar to the previous throw, it is very important that you have a strong stance that will be able to support you during this throw. When first attempted, many students tend to forget to pull on their partners arm, which causes people to land flat on their back and have the breath knocked out of them. It is very important that you make sure that your partner rotates onto their side at the completion of this throw. It is also important to remember that the leg you have extended backwards outside of your partners feet should be low, almost parallel with the mat, otherwise you could end up blocking your partners knee and cause injury.